The Chiang Mai Mail joins the nation in wishing HRH Princess Maha Chakri Sirindhorn a very happy birthday. The Chiang Mai Mail joins the Kingdom of Thailand in wishing Her Royal Highness Princess Maha Chakri Sirindhorn a very happy birthday on April 2. We join in with our most humble wishes for HRH Princess Maha Chakri Sirindhorn for a long, healthy and happy life. Her Royal Highness Princess Maha Chakri Sirindhorn was born on April 2, 1955, the third child of Their Majesties the King and Queen of Thailand. She earned a Bachelor of Arts from Chulalongkorn University, a first class honor, and a gold medal in History in 1976. She earned an M.A. in Oriental Epigraphy (Sanskrit and Cambodian) from Silpakorn University in 1978, and an M.A. in Pali and Sanskrit from Chulalongkorn University in 1980 and a doctoral degree in Developmental Education in 1987. HRH the Princess has developed special interests in agricultural extension to improve school children’s nutritional conditions; supports education from pre-school to tertiary levels; and mother and child care. She has also concentrated on helping the handicapped, especially in using information technology (IT) to develop independent living and learning skills. HRH the Princess has been Executive Vice President of the Thai Red Cross Society since 1977; Executive Chairman of the Chaipattana Foundation (in charge of His Majesty’s development and environmental preservation projects), Ananda Mahidol Foundation (to promote higher education), the King Rama II Foundation (to conserve and promote Thai Culture); President of the Sai Jai Thai Foundation (to support disabled veterans), Prince Mahidol Award Foundation (to award prizes annually to members of the international community for outstanding performances in the fields of medicine and public health); and Adviser of the Committee of Thai Junior Encyclopedia Project by Royal Command of H.M. the King. The Chiang Mai Mail humbly joins the Kingdom of Thailand in wishing Her Royal Highness Princess Ubolratana a most happy birthday on April 5. Her Royal Highness Princess Ubolratana Rajakanya Sirivadhana Phannavadi was born on April 5, 1951, in Lausanne Switzerland. She is the eldest child of Their Majesties the King and Queen. HRH Princess Ubolratana is a very devoted leader of young people in the campaign against drugs, and as such has instituted and keenly watches over the To Be Number One project, encouraging family values, music and sport as alternatives to drug use. She has also set up the Khun Poom project to assist autistic children in Thailand. In 2008, HRH Princess Ubolratana played the main role in the Thai film Where The Miracle Happens. She has been an active supporter of the Thai film industry for many years promoting Thailand as a destination for filming, production and post-production. Chiang Mai districts report to the provincial government on a weekly basis so that the government can monitor the situation closely and distribute water to people if needed. The government implemented a plan to set distribution points that are convenient to the public in each village in high risk areas. Chiang Mai has been divided into 5 zones with government agencies support for water trucks. They have also prepared water pumps and equipment to alleviate drought and examined water resources and containers. As of March 13, 8 districts, 29 sub districts and 212 villages have been hit by drought affecting 77,871 people. The districts with the worst conditions are Doi Tao, Om Koi, Hang Dong, Doi Lo, Phrao, San Pa Tong Chai Prakan and Hod. Two districts are seeing a shortage of water affecting 21,005 people. The impact on agriculture has affected 71,856 rai. A father and his son were killed in a fire in an internet café on March 13, 2014, the mother and daughter escaped the fire with injuries. 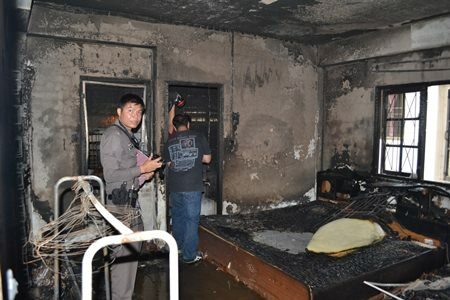 San Kamphaeng firefighters and police rushed to the scene of a shop house fire at 4:30 a.m. on March 13, 2014. The building, the scene of Tum Electronic Shop was ablaze when firefighters arrived and it took them more than 30 minutes to put out the fire. After the fire was out police and forensic experts examined the scene of the fire and found 20 computers in the internet café on the ground floor. The second floor was used as computer equipment. In the bathroom of the 2rd floor they found the body of Thiradech Kasemchokekchampol, age 38 and the body of his 15 year old son on the terrace. The firefighters believe they were trapped in the fire that started on the ground floor and spread to the second and third floors. Waraporn Kasemchokekhampol the 37 year old mother and their 13 year old daughter were injured in the fire. Investigators believe the fire may be caused by a short circuit but will investigate to find the exact cause. The suspect confessed to police that he met a nurse on Facebook and met her for drinks where he drugged her drink and stole her car. Police arrested Siriwech Sithiwech, age 27 of Nakhon Si Thammarat on suspicion of drugging and robbing an Udon Thani nurse. The suspect confessed to police that he had met the woman on Facebook and met her at a hotel in Udon Thani. It was there he told the police that he drugged her drink, took her up to a hotel room where he stole her iPhone, a gold necklace, 4,000 baht in cash and the keys to her white Honda Civic. Udon Thani police issued an arrest warrant for the man but he had taken the car to Chiang Rai where he planned on driving the stolen car to Phayao to visit his wife. They tracked him to Phan District in Chiang Rai on March 11, 2014 where they arrested the suspect and charged him with theft. Two women were arrested by the Narcotics Suppression Police smuggling 350,000 Yaba tablets in Phayao. Over 8 days from March 9 to March 17, police seized over 1.65 million methamphetamine tablets in 7 different arrests around the North. On March 9, 2014 7 men from Chiang Dao were arrested with 192,000 methamphetamine tablets stamped with the WY logo on Chotana Road in Mae Rim. Police had the gang under surveillance and saw them receive the drugs in Fang, they tracked them in two cars as they returned to Chiang Mai and intercepted them in Mae Rim where they found the drugs packed in bags. The suspects confessed that they had been hired to carry the drugs to Central Thailand. Police are expanding their investigation to find more members of the gang and are taking action to seize property. Mae Sai Police received a report that a drug trafficking gang would be sending drugs at a transport company on March 10, 2014 on Highway 123. Police set up an ambush to arrest the gang near the transport company. The police saw a black motorbike parked nearby and asked the driver to check it but he pulled out a gun hidden under his jacket and opened fire on the police. Police returned fire killing the suspect. They found 190,000 methamphetamine tablets in a black bag near the body. A 34 year old woman from San Kamphaeng and a 25 year old woman from Nan were arrested by Narcotics Suppression police with 350,000 methamphetamine pills in Chun District in Phayao. The police had learned that the gang planned smuggling drugs from Wiang Pa Pao in Chiang Rai to send to Sukhothai in a Mazda pickup truck and an Isuzu truck. Police stopped the vehicles but the Isuzu pickup managed to escape. Police found drugs hidden in a large plastic water pipe in with home decorations. The two suspects confessed that smuggle the drugs to Sukhothai for 200,000 baht. Police later seized property belonging to the women in San Kamphaeng valued at 5 million baht. On March 12 the Border Patrol Police arrested a 33 year old Chiang Dao man with 30,000 methamphetamine tablets at a restaurant in San Sai. The police had information that the man was smuggling drugs to deliver to a buyer in Chiang Mai and tracked him to the restaurant where they arrested the suspect. He confessed to police that he had been hired for 10,000 baht to smuggle drugs from the border to Chiang Mai. On March 17 the police announced two separate arrests that resulted in the seizure of a total of 488,000 methamphetamine tablets. In the first case police arrested a drug trafficker on the Chai Prakan – Phrao road with 340,000 methamphetamine tablets hidden in the modified chassis of a car. The suspect was sending the drugs to a buyer in Bangkok. There was that a second car involved but the driver managed to escape from police. Three drug traffickers were arrested with 108,000 methamphetamine tablets on the same day on the Mae Malai- Pai Road in Mae Taeng. The three suspects confessed to police they brought the drugs from the border in Chai Prakan to smuggle to Central Thailand. 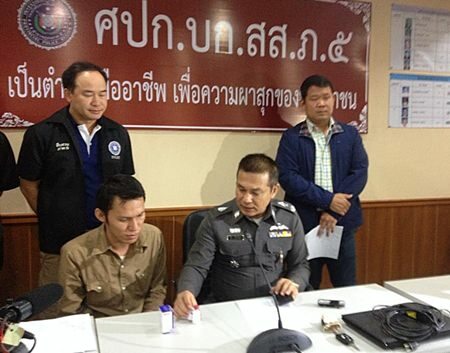 Two men from Mae Taeng were arrested by police with 440,000 methamphetamine tablets in a pickup truck. Narcotics Suppression Police reported that they had information on a gang that as smuggling drugs from the border in Chiang Mai and intercepted the truck and surveillance car in Mae Rim. Later police seized property belonging to the suspects in including a 5 rai longan orchard in Mae Taeng, 98,000 baht in cash and other property with a total value of 5 million baht. President of the Provincial Administration Organization Boonlert Buranupakorn said that one of the biggest obstacles facing education in Chiang Mai was the inequal access to education for disadvantaged children. Chiang Mai’s biggest obstacle in education is the inequality of educational access for children, President of the Provincial Administration Organization Boonlert Buranupakorn said at a seminar held recently. 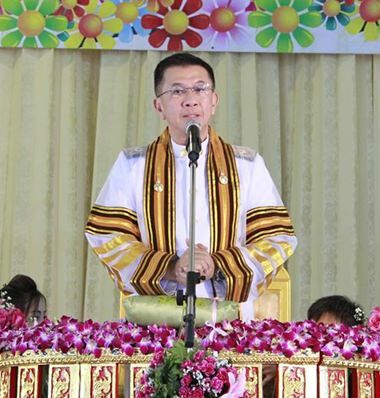 The President noted at the PAO is responsible for improving and promoting education in the Chiang Mai area according to the Provincial Administrative Organization Act, B.E. 2540 (1997). President Boonlert said that the Chiang Mai PAO has been developing teachers and personnel, supporting materials for teaching and others. He noted that in basic education in Chiang Mai, including both formal and non- formal education, there are a total of approximately 1,120 institutions, 350,000 students and 14,000 teachers and personnel. He added that in addition to the inequality of access to education that sees many disadvantaged children, disabled children, hilltribe children and alien children unable to obtain schooling or have access to limited schooling, often due to living in remote regions, that another issue is that Chiang Mai students do not continue on with their education and educational management has no unity. At the seminar, President Boonlert said the PAO had accelerated efforts to solve these problems and increase the quality of education of students of all institutions as Chiang Mai students need to be prepared for the competition they will face with the onset of the AEC. Governor Wichien Puthiwinyoo donates 50,000 baht of his own money to the fund to assist rice farmers after the rice pledging scheme collapsed. Chiang Mai Governor Wichien Puthiwinyoo donated 50,000 baht of his own money to the fund to assist rice farmers left in limbo from the rice pledging scheme. The Governor donated the money to a fund set up at the Bank for Agriculture and Agricultural Co-Operatives (BAAC) office Chiang Mai on March 5, 2014 through Sommart Buppako, Deputy Director of Affairs Department, upper north branch of BAAC and Sakchai Khamruangrit, Director of BAAC Chiang Mai. The fund was established at the BAAC to help farmers who are suffering after not receiving payment under the government’s rice pledging scheme. The fund was set up as a short term solution to assist farmers in need and is funded by the Thai public and their generosity to help farmers while they await money from the government. The fund is limited to 20% of the debt that the rice pledging scheme owes the farmers and the Bank said that it is managing the funds in the account that is also receiving interest. Hug Academy, in cooperation with Promenada Resort Shopping Mall held the B-Boy Battle 2014 on March 15, 2014. The dance competition featured teams from around Thailand competing in b-boy dancing, a new form of breaking that features athletic moves coupled with dance. The competition saw prizes valued at over 30,000 baht handed out to the teams. The international judges from Oman, Switzerland and Thailand chose Hippo Vised Skill out of Bangkok as the top dance team competitions that ran all day. Runner up teams came from Bangkok, Chiang Mai and Lampang. Business owners at the Harbour Community Mall filed a series of complaints with the Chiang Mai Governor asking for mediation to resolve the outstanding issues. A group of business owners at the Harbour Community Mall on Huay Kaew Road handed over a petition filled with complaints against the mall’s owner to Deputy Governor Chana Pangpibul acting as Governor Wichien Puthiwinyoo’s representative on March 11, 2014 at City Hall. The group, which was led by Kittiya Wittayanin, stated that the Harbour Community Mall which has been operated for more than a year by Nakorn Kornherun, Founder of Wuttisak Clinic Co., Ltd. had not fulfilled its promises to market and promote the mall. The business owners state that the mall had presented a comprehensive marketing and advertising plan to attract tenants but later did not follow through and advertise as promised. The group claims that more than 95% of the businesses in the mall have shut down and many of the people are suffering from loans taken out to start business in the mall, noting that many of them had to fit out the shops themselves and that the extra cost had not been recouped. Recently, there had also an announcement to sell the mall to another company however, the group filed a lawsuit against the mall under the Consumer Protection Act in Chiang Mai Provincial Court in mid-2013. 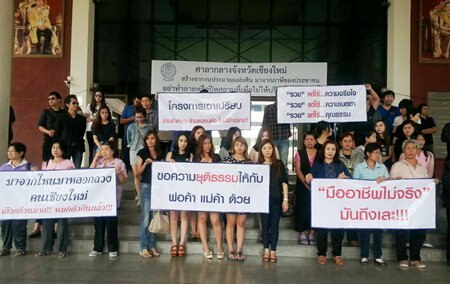 Twenty three people are in the action asking for damages of 32 million baht. The case is still in process in the Courts so the group has asked the Governor to mediate with the mall to take responsibility in the matter and reimburse business owners for costs of fitting out and refund the 3 month deposit to everyone who rented a space.